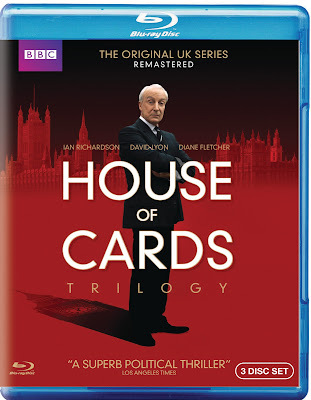 On February 1st , Netflix made available to its subscribers an all-new adaptation of the BBC classic The House of Cards. This starred Kevin Spacey as Francis Underwood and is being met with great success. I haven’t had a chance to watch this yet. I plan on watching it and I anticipate it being really good. One reason why I haven’t had a chance to watch the US version is because I have been happily taking my time and going through the recently released Blu Ray set of the original BBC version starring Ian Richardson as Francis Urquhart. 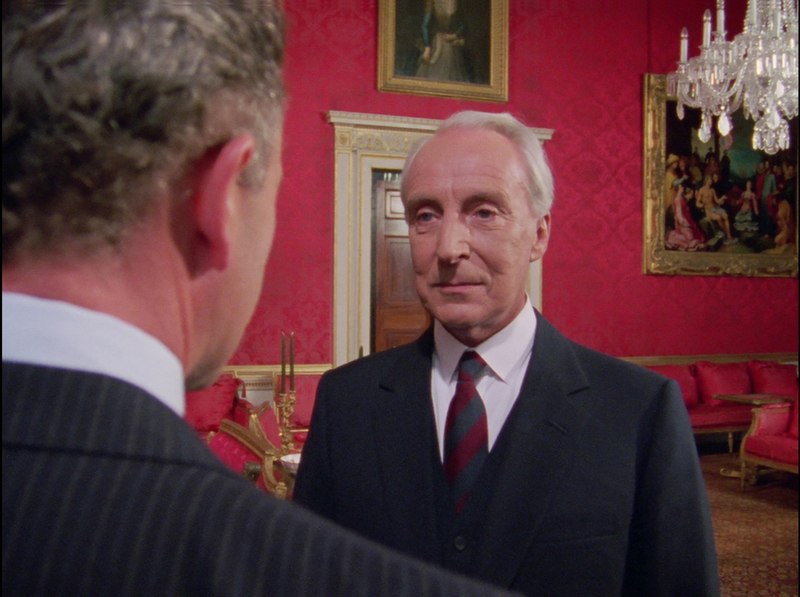 The House of Cards is unintentionally named as the entire series of the Ian Richardson political thriller but it is more appropriately called the The House of Cards Trilogy. The House of Cards is actually the name of the first series made in 1990 followed by To Play the King in 1993 and finished up with The Final Cut. It’s an important distinction. This is a long-awaited release by me since the series was broadcast in Standard Definition(SD) television in the 1990s but was shot on film 16mm film which was still retained in the BBC Archives which allowed a re-transfer of film to create a new High Definition(HD) presentation of this series. I think I need to point out right now that The House of Cards (the first series) is one of my all-time favorite series ever. Although two more followed it, it would be impossible for them to follow along at the level of quality that was displayed in The House of Cards. The title really says it all. The series was an adaptation of the novel of the same name from author Michael Dobbs aka The Right Honourable The Lord Dobbs. Lord Dobbs was a former Chief of Staff at Conservative Party Headquarters. Although the series first aired in 1990 I, myself, did not get into it until 2007 when Ian Richardson passed away. I knew of his work and I had the trilogy from the original DVD set. One night I decided to have a look at this. I have friends who love this series and I wanted to see what it was all about. Sometimes it takes me a while to look at things that are considered classics by others. I had a feeling that The House of Cards would be really stuffy. I mean it deals with politics so it can’t be enjoyable, right? 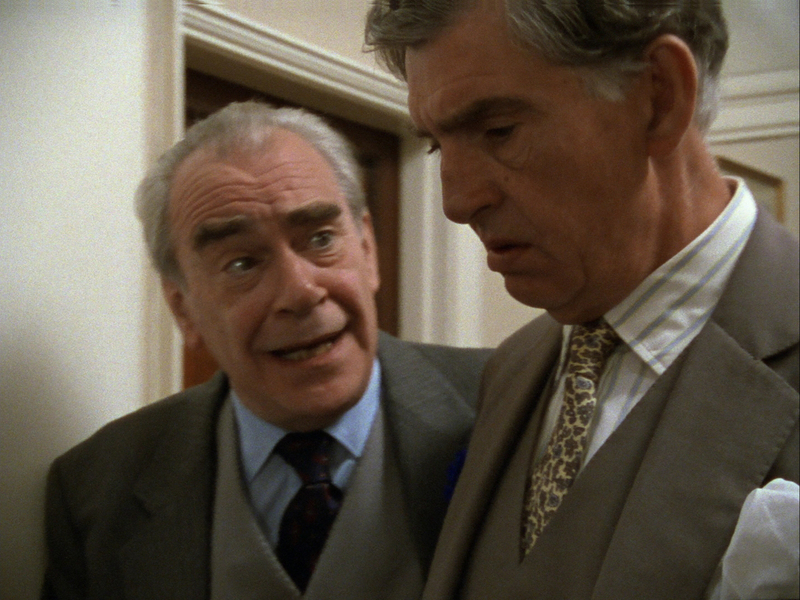 I call this the Yes Minister syndrome and I talk about it in my article I wrote about my admiration for Yes, Prime Minister here. 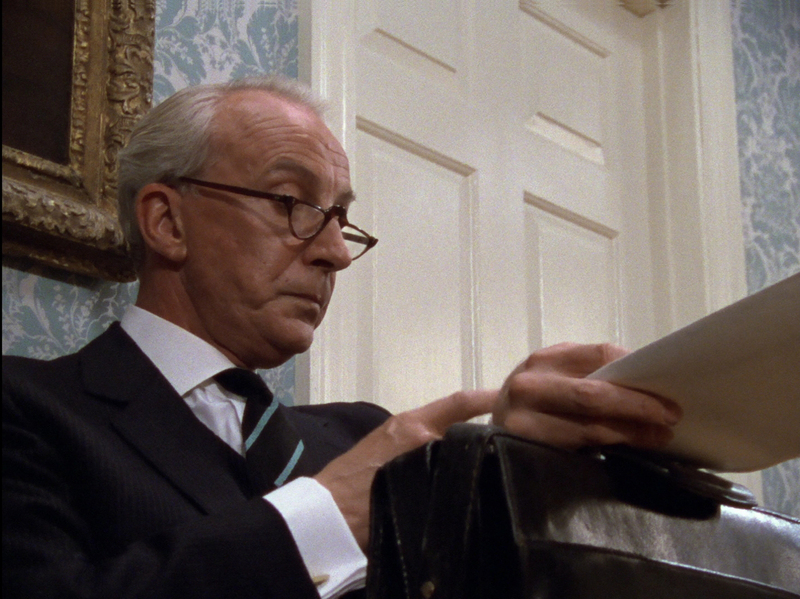 It took no time at all to not only be hooked but brought into the story by the charm of Francis Urquhart. The story surrounding The House of Cards begins with a new election. The series has a sort of pseudo alternate Earth sort of feel to it as it is implied that the outgoing Prime Minister was Margaret Thatcher. The new Prime Minister will be Henry Collingridge. This is good news for Francis Urquhart as he has worked very hard for Collingridge and expects a very nice position in the new government. Currently Urquhart holds the office of Chief Whip which yields a fair amount of power in the government but Urquhart expects more for him. Much to his disappointment he is overlooked for a prominent position in the new government. In fact, the government is not going to change much at all under Prime Minister Collingridge. Urquhart takes matters into his own hands. He is tired of being overlooked and has ambitions for higher office. He feels betrayed by Collingridge and he is going to do something about it. I am sure the majority of the people who are reading this may have seen the series before so don’t need to know plot specifics and for those who have never seen it before, I do not want to ruin the excellence that is this series. I will explain in basics. 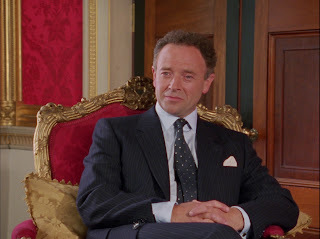 Urquhart takes his knowledge of everyone in the government and in some cases their relatives and clinically dismantles all of them for his own means. He takes information only to feed it to someone else who uses it to Urquhart’s advantage. When I watch it, all I can do is sit back and enjoy the ride. Nobody knows he is doing it. Then there is Mattie Storin. She is a young reporter for The Chronicle. She is naïve in many ways but wants to make a big impression. She knows that everything that is falling apart around the Collingridge government could bring her a huge story and a big break. She takes the unusual step of going to Urquhart’s private residence to interview him assuming that he will throw her out. She is surprised (as well as Urquhart himself) when he allows her to stay and allows her to ask him questions. The responses can be used in articles under the guise of anonymity. She caught Urquhart at the right moment as his ideas have been rejected by the new government and he’s planning to do something about it. Soon they start having an affair. Mattie is just one of many in this series that is being used by Urquhart. He is able to pass information to her that is false or misleading that will further his own goals and hurt others. As a political thriller this could easily have been run of the mill but two key things happen in this production which differs substantially from the original novel. 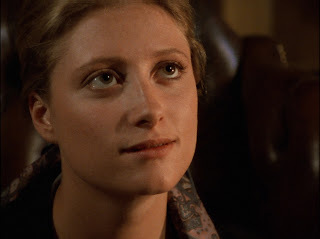 In the novel, Mattie and Urquhart do not have a relationship of any kind. In fact, she is investigating the extraordinary events in the downfall of Prime Minister Collingridge. She never has an affair with Urquhart. Having Urquhart use Mattie in the television version is a masterstroke that completely sets apart the two versions. Also, I think the narrative of the series could have been pretty dry but the television series made the bold move of having Urquhart often break through the fourth wall by addressing the viewers. He does this to introduce us to the characters while delivering his commentary on whether or not they are fools. He will explain to us why certain things are done in certain ways. He will also tell us why he needed to do some of the things he did to get to his ultimate goal. The problem is that I could almost sympathize with him. Urquhart has a charming side. He also has an evil side. It’s easy to forget he is the villain of the series. That becomes more apparent as the series goes on. When I started to watch it for the first time, for me when Urquhart first addresses the viewer, I knew I was going to like it. He has a dry wit to him and makes this program stand out because of it. The House of Cards boasts an amazing cast. 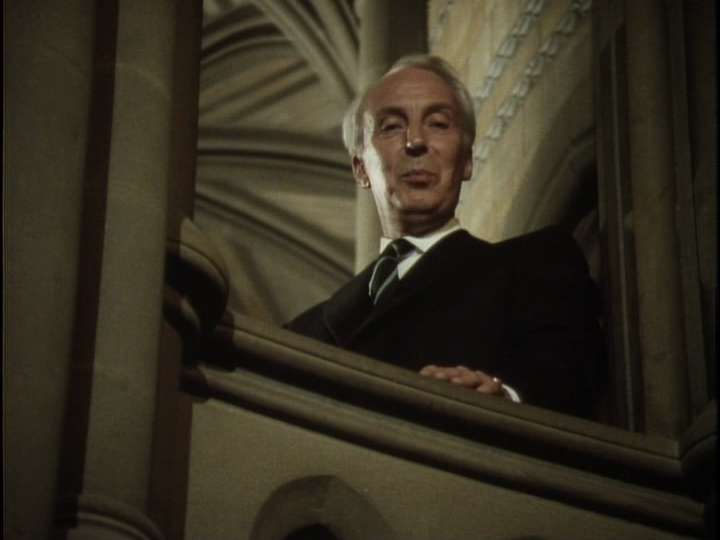 Of course Ian Richardson plays Urquhart with a touch of Richard III and as an English gent. Susannah Harker is Mattie Storin. Their relationship is key to how this series progresses. 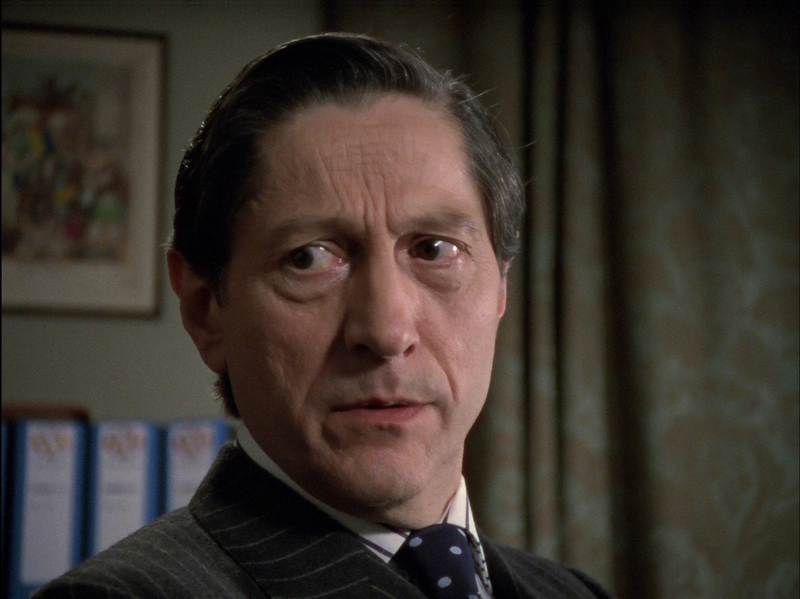 My favourite of all is Colin Jeavons as Stamper who assist the Chief Whip and is privy to much of what Urquhart is doing. What is Urquhart’s ultimate goal? To be Prime Minister which he achieves at the end of the series. It’s not so much a spoiler because how he gets there and who he destroys and how he destroys them along the way is really part of the fun. By the start of the second series things have moved on quite a bit. Once again in this parallel world Queen Elizabeth II has died. They never mention her by name but it is implied. A new King is crowned. The King has no name in this program. Once again, there is a lot of similarity between this King and Prince Charles. They are the same age and the King in To Play the King has a lot of “Global initiatives” he wants to bring to the government for help. What the King wants and how Urquhart wants to run his government are at odds with each other. The King needs to be seen to support the government which is not what is happening. In fact the King will start to attack the Prime Minister on their differences in policy publicly. Once again, it is fun to watch Urquhart dismantle anyone in his way. Does enjoying this make me evil? To Play the King is really good but not as good as The House of Cards. I think a big reason for this is that they are two very different stories. 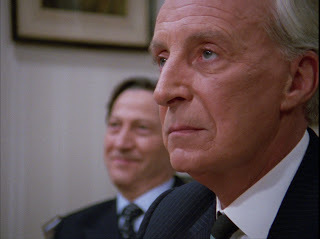 In The House of Cards, Urquhart is playing everyone from behind the scenes. Here he is running the government. He is the face of the government. A lot of that manipulation is missing from Urquhart. He can take more straightforward means to accomplish what he wants but don’t worry there still is a decent amount of blackmailing present! A couple of issues for me are that Urquhart runs a thug government. There are a bunch of thugs who strong arm what they want. At times it almost feels like I am watching the Mafia. I suppose that is the next level after what Urquhart achieved in The House of Cards. There is another great guest cast and at the front of it is Michael Kitchen as the King. He plays it with a snobbish desire to help others without really knowing the logistics of doing so. To those who have seen it before, does it seem like at just about the end of every scene he walks out of a room to another doorway or opens up a bookcase and walks into it? A new character is introduced named Corder. He appears to be a personal body guard to Urquhart but he is so much more. He is a big part of the thuggish government. 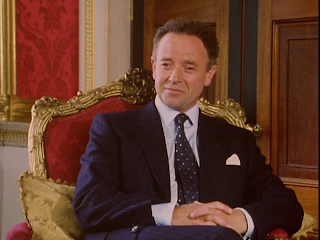 One more thing, the King’s Chief of staff David Mycroft is a secondary story in this series. Mycroft went to school with the King. After having a horrible marriage, Mycroft literally stumbles into the life of another man and they begin a homosexual relationship. This side plot is interesting but it’s really not that convincing. It seems forced and not realistic. Just a minor quibble. When we rejoin Urquhart he has been in office for about 11 years. We see some visual foreshadowing of things to come in the first scene. 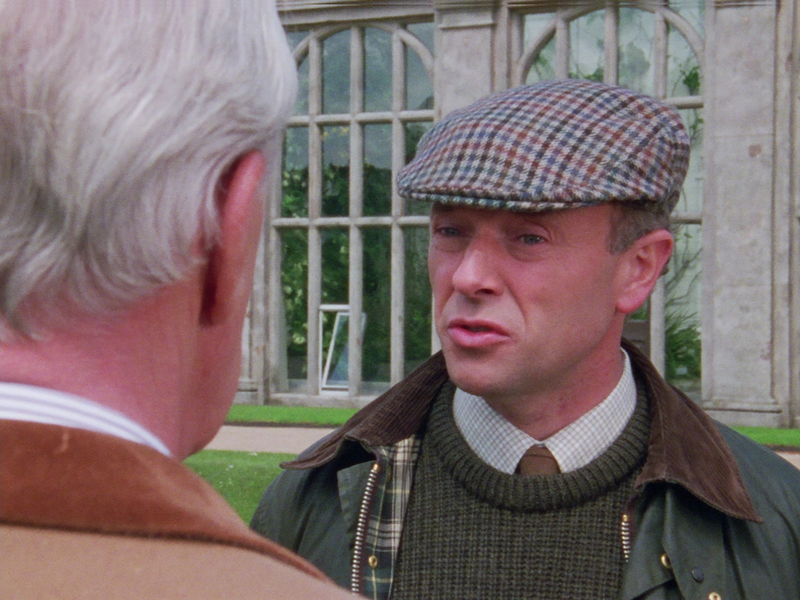 We are encountered with a version of Urquhart who is surrounded by enemies and who is also not nearly as sharp as he used to be in previous years. He will be soon challenged for the leadership of the party. Once again, in this parallel universe we start with the funeral of Margaret Thatcher. Yes, I needed to check Wikipedia to make sure I was not imaging things since she is still alive. Urquhart is close to surpassing her in terms of how long they both have been in office as Prime Minister. A big part of the story surrounds what Urquhart did in Cypress as a soldier in 1956. A Greek man who now lives in London wants to know what happened to two Greek Cypriots who were killed in 1956. This man’s daughter hopes that Urquhart could help her track that information down. Little does she realizes when she speaks to the Prime Minister, she is speaking to her uncles killer. In House of Cards it seems like Urquhart was a good man who kind of decided to take his future into his own hands when he started on his journey to Prime Minister but it appears in this series that Urquhart had been a bad man and murderer most of his life. I am not a huge fan of that. I think this is the weakest of the 3 series. In fact, watching the first episode I wasn’t really sure what to think at all! I have been waiting so long to see it and was very disappointed. To me, the episode plays out like an amateur production of The House of Cards that Ian Richardson has kindly agreed to take part in for some reason. I don’t mean to disrespect that amazing talents of such artists as Isla Blair, Paul Freeman or Nickolas Grace. I was getting annoyed by everyone calling Urquhart F.U. 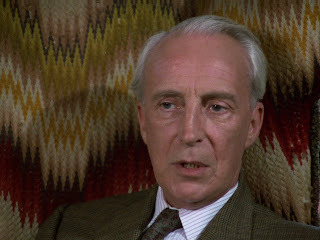 (Francis Urquhart) which I heard a few times in To Play the King but the nickname is exhausted fairly quickly in this series. Luckily the series redeems itself more towards the end of Episode Two. There is a point in which Urquhart clears his brain a little bit and starts behaving more like the Urquhart that I want to watch. What made the first series great was what made the third series a little strange. 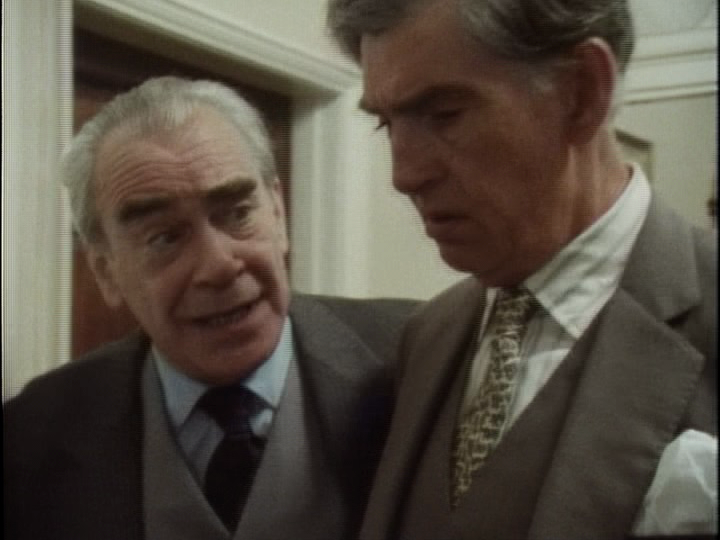 Much of the time in The Final Cut, Urquhart is talking to us. He has always done it but it seems a lot more here. I think one reason is that he has very few allies left that he trusts or has any respect for. He really has no one to talk to except us! Also, it may be a glimpse into how Urquhart himself is losing his grasp on his own reality. Production wise this plays out very differently from both The House of Cards and To Play the King. 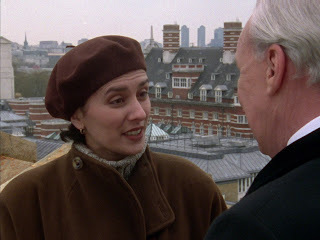 The previous two series were directed by Paul Seed who used imagery to sell the ideas such as when Urquhart was up to no good scene changes would be accentuated by a rat running around. The Final Cut was directed by Mike Vardy. To me it lacks any imagination. It is just not as visually stimulating as the other two. Also the music on The House of Cards and To Play the King was done by Jim Parker. I praise his work in my article for Mapp & Lucia here. He has also done music for Midsomer Murders and Foyle’s War. In fact if you are familiar with the music from Midsomer Murders, then pay attention when watching The House of Cards how similar in sound the two scores are in orchestration. I would have bet money that Jim Parker did not do the music for The Final Cut but apparently he did. It does not have the quizzical nuances on the score that lead me into scenes that are often cued by an oboe. Everything on this production feels straight forward and not special or unique. I still liked it and The Final Cut redeemed itself in the end but when you are served a thick slice of prime rib with The House of Cards, I feel I have the right to be disappointed with an Arby’s roast beef sandwich with The Final Cut. Hmmm…. I have never thought about doing a rating system for reviews before but maybe instead of doing rating system based on stars I do it based on food. No? Ok. Audio Commentary: Commentary with Ian Richardson and Andrew Davies for the first episode of each of the three series. This was imported over from the DVD set. 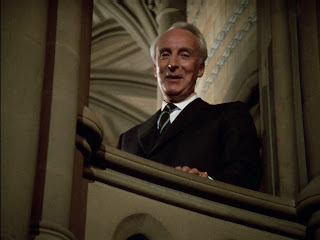 It is of course a very precious extras as Ian Richardson passed away in 2007 and it is nice to hear him talk about these productions. An interview with Andrew Davies on the To Play The King controversy: This is an excerpt of the BBC program Bite Back. Viewers react strongly to Andrew Davies insinuating in To Play the King that the King sends out for prostitutes. Why should they care? This is a fictitious King! Well, as mentioned above the correlation between this King and Prince Charles has some strong similarities that did not go unnoticed by members of the public. 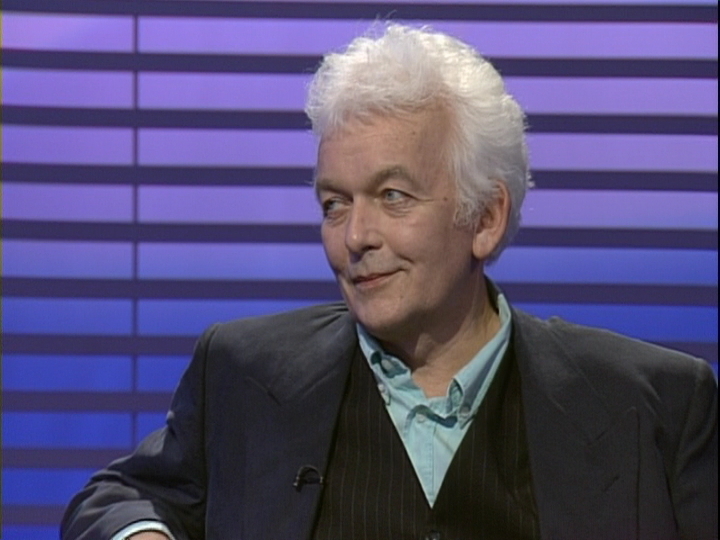 Watching the clip is fun and I really don’t think Andrew Davies comes out of it too well. This was also in the last DVD release. Westminster: Behind Closed Doors with Tony Benn: This is hosted by Tony Benn who was a Member of Parliament and a Cabinet Minister. This production is from 1995 and I love it. He takes a camera into interview people who worked there and get an “inside” look into the place. It originally aired in December 1995 on BBC Two. 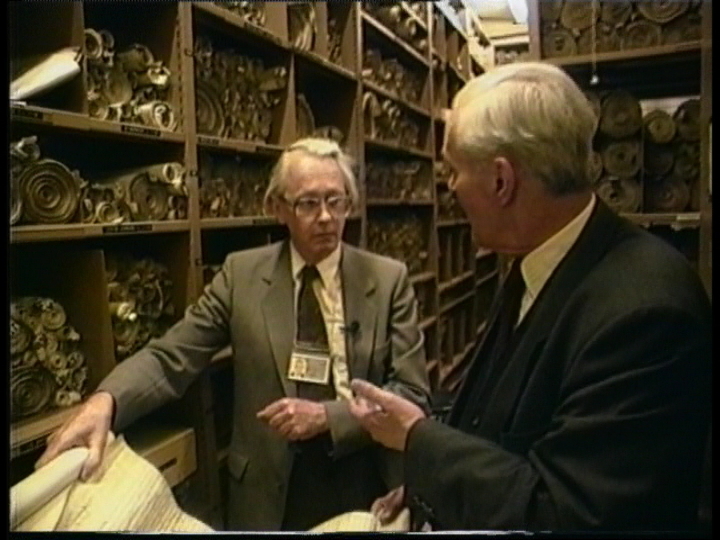 Tony Benn is an approachable and inquisitive host. If you are a Doctor Who fan, you would have seen another program of his on the DVD for The War Machines: One Foot in the Past which this edition focuses on the Post Office Tower. It’s one of my favorite extras in the range. In my opinion, as much as I like newly created content for extras, what really gets me smiling is when stuff like this is included. Older programs that would otherwise gather dust on the shelves in an archive somewhere. I love it! This is new to the set and was not on the previous DVD sets. Thank you to the BBC for this extra. As I mentioned above, all three series were shown on BBC 1 in SD. The series were shot on film and transferred to tape for edit. In this case the tape would have possibly been 1" for the first series and D3 tape for the other two. 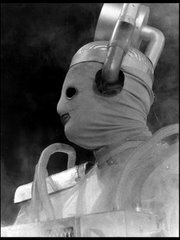 For this release, the BBC went back to the original film (I assume the negatives) and re-transferred the film into HD. For the most part I think the new transfers look spectacular. It’s cliché to say but this program never looked better. This restoration started with a 2K scan of the camera negatives, made on the Scanity film scanner at TV Centre. It was graded on Nucoda Film Master through a 42” Dolby reference monitor, with grain management by DVO Tools and Dark Energy and frame cleanup on Dustbuster +. 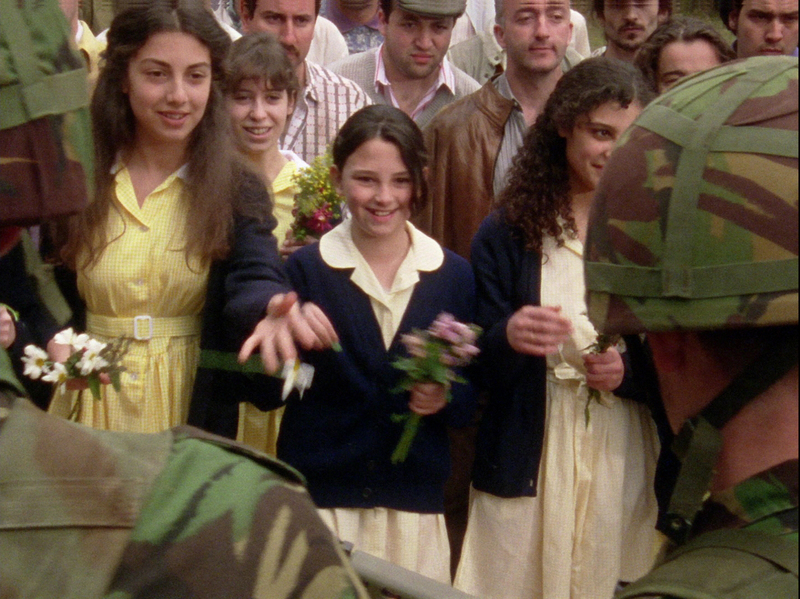 The Final Cut was shot on Super-16, although framed for 4:3. It would have been possible for that series to generate a true widescreen transfer. Thankfully they kept the original 4:3 aspect ratio. 50i masters of all 3 series exist too which could allow for a possible UK release although the original request was to make 23.98fps progressive versions. Though one thing I did notice was that I felt people’s faces were too red in some scenes of To Play the King. Sometimes it looks like their faces were burning or they had a fever. I found this in scenes that had Urquhart and the King outdoors. I also found this in the scene where Mycroft and the King are swimming together. Yet, that may make some more sense since they have been exercising. The fact they went back to the film for a new transfer is great. This is a prestigious series that deserves to look as good as possible. I am very happy with it. To be honest, it’s a much better example of taking care of these precious assets than the debacle with Tinker Tailor Soldier Spy. In 2012, Acorn Media released the Blu Ray of the 1979 Tinker Tailor Soldier Spy. They did not go back to the original film for this but up-resed the SD picture to be HD. The results to me were very poor. When I watch that series I prefer to watch the DVD over the “HD” Blu Ray. The House of Cards HD transfer is great and I am so glad they did it. Of course, it wouldn’t be me if I wasn’t unhappy about something. The end credits have been re-made for all 3 series and they are present with the current BBC logo on them opposed to the BBC logo of the time. Now, in my opinion the BBC logo of the time was ugly but I feel it should be there. Now since there is no unofficial House of Cards Restoration Team like there is for Doctor Who, I will just shut up. Perhaps what might happen is that this series could get a re-showing on PBS sometime in HD. Maybe it could be part of the Masterpiece Classics. Having this shown in HD would be really cool! Below are some examples between the HD and SD versions of the series. Please click on the images to get full resolution. I think the cover for this is really simple and clean. It’s all you need really with Urquhart standing there looking at you. I do miss the type treatment that included card suits as part of the lettering from the last release of this series. This set is housed in a standard sized Blu ray case that holds 3 discs. The menus are in 16:9 (the programs are in original 4:3 ratio). Once again, the layouts of the menus are simple and clean. It’s very easy to maneuver through and is consistent to the overall style of the set. The House of Cards is possibly my favorite series. I actually mean the first series but the other two are very good too. The House of Cards sets such a high standard that it’s difficult for the other two to compete. That being said, this set has more good things going for it than bad. It has The House of Cards on it which is worth it on its own, it has a beautiful new HD transfer, it has a new extra that is interesting and you can hear the late Ian Richardson talk about his work on it. Plus, it’s at a really affordable price. It’s a great deal! What? You think I’m biased? You might very well think that; I couldn't possibly comment. Upcoming DVD/Blu Ray Reviews: Something that just showed up in my mailbox is the complete 22 disc set of Foyle’s War from Acorn Media which will be released in March. I am taking my time to savor this World War II era crime series that has lush production values and of course Michael Kitchen! This Week: For the next couple of articles I was planning to look at a very different kind of comedy with Series 2 of ‘Allo ‘Allo! I may hold that back for a while. It will either be that or an episode of Out of the Unknown. Does anyone know if the Blu Rays in this US set are region-free? It appears so. I was able to play it on my Region B PAL Blu Ray set.